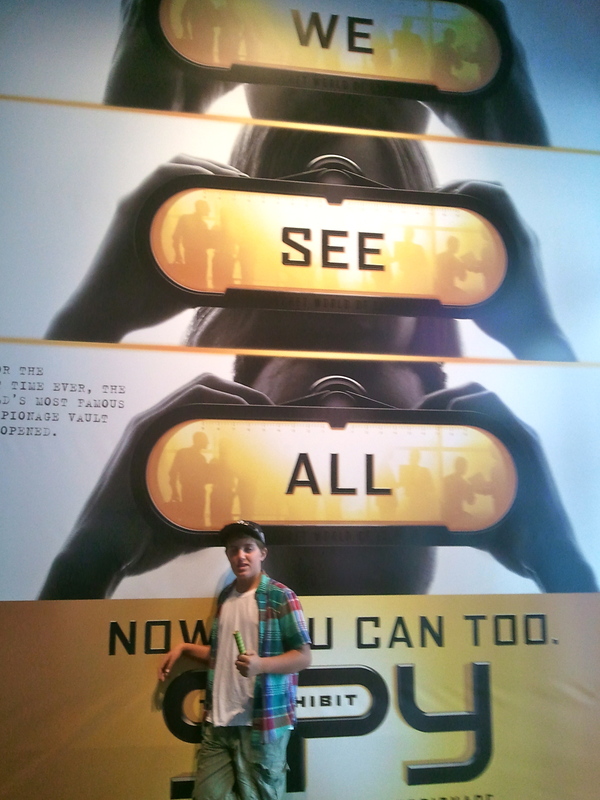 Last week we stepped into the secret world of spying at the new exhibit at Discovery Times Square. We have been to the International Spy Museum in Washington, D.C. and loved it so much that I looked into the Spy-In-Training Program for my son. The price was reasonable, but my son is 13, and the program is for 14 to 17-year-olds. Since plan A didn’t work out, I decided to implement plan B, and we headed to NYC instead and entered into the secret world of espionage. I have been to many exhibits at Discovery Times Square like the Titanic-The Artifact Exhibition, King Tut, Pompeii, The Dead Sea Scrolls and the CSI: The Experience. One thing they all had in common was a theatrical opening where you enter the time frame of the exhibit. The Spy exhibition was no different. We were told to forget our knowledge about spies and promises were made were we would be taken beyond the fiction of the movies and novels and uncover the fascinating truth of the world of patriots, spies, moles, traitors, and spy-catchers. We learned that seventeen intelligence agencies contribute to the presidential daily brief each morning for the simple reason to protect our country’s interest and keep our citizens safe. Exhibits ranged from underwater secrets to the U-2 Spy Plane. My son, of course, liked the Hidden in Plain Sight where everyday items were turned into devices to conceal supplies or information. Needless to say, he left the gift shop with a bank that disguised as a shaving cream can. 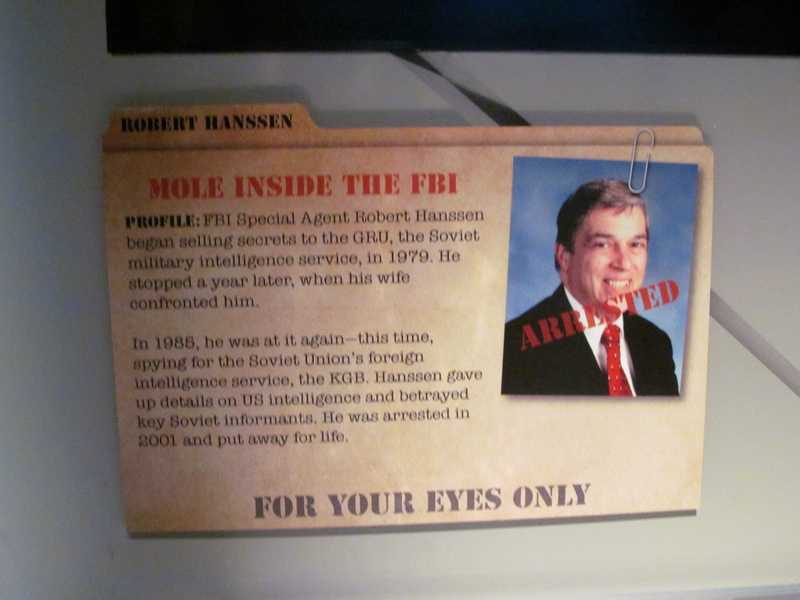 I liked the exhibit on traitors, specifically reviewing the information on Robert Hansen. I recalled that many things in this section had been on display at the International Spy Museum, but for some reason, I was still fascinated, perhaps because I still remember when the story broke on the news. Hanssen’s handwritten letter of apology that he read at his sentencing in 2002 was on displayed. 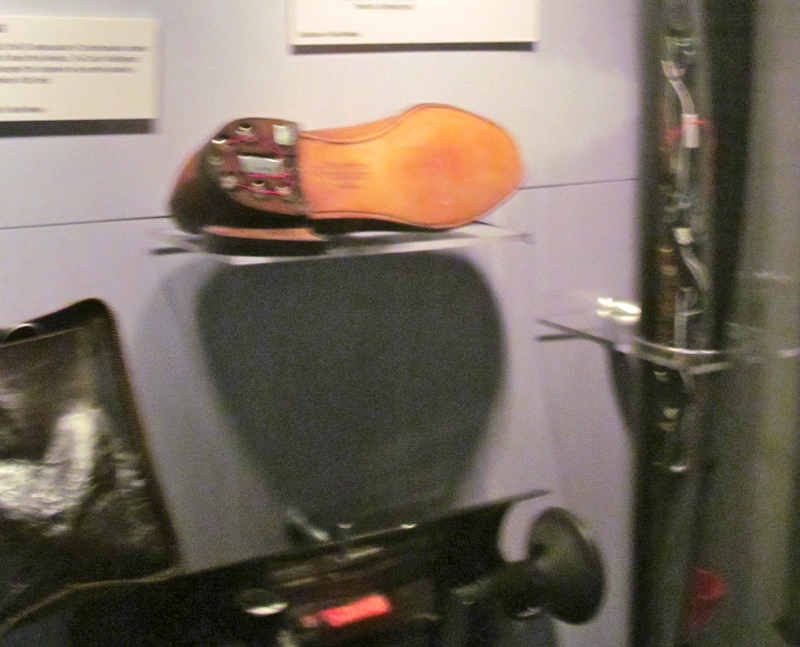 Bug planted in the US ambassador to Czechoslovakia’s shoe in 1960. The best part of the exhibit was the interactive exhibits where we could alter our appearance and voices. We were able to photograph ourselves and then digitally add disguises and record a voice message and then change them by a press of a button. The highlight of the exhibit was the laser maze. Here you had twenty seconds to navigate the laser lines without setting off the alarm. All I have to say is that I won’t be cast anytime soon for Mission Impossible 5, but maybe I’ll get a call for a Get Smart sequel! My son is fascinated with the world of spies, and this was one of his favorite exhibits. We most probably will still check out the Spy-In-Training Program at the International SPY Museum next summer, but until then he will just have to pick up Thomas B. Allen’s book, George Washington, Spymaster which is on his summer reading list. What will be your family’s next mission? Decipher the code to find out!